If you’ve read my blog for a while, you’ll notice I have a love of vegetables and fruits but also eat a gluten-full diet. I’m never one to restrict, but instead I try to eat a balanced diet of whole grains, fruits, vegetables, nuts, seeds, lean meats, beer, and dark chocolate. Yes, beer is part of a balanced diet. I didn’t say I ate a perfect diet. My breakfast and lunches are pretty consistent: breakfast is oatmeal with fruit and nuts or seeds and lunch is usually a sweet potato with eggs, beans, or nut butter and roasted veggies. Dinners, however, are where I like to get creative and try to simultaneously maximize flavor while optimizing nutrition. Lots of vegetables, a healthy serving of lean protein, and a good seasoning with some healthy spices. That said, some of my favorite dinners are where all the carbs meet all the vegetables. I love whole wheat spaghetti with tons of spinach and tomatoes or a creamy risotto served with roasted cauliflower. I figure that packing multiple servings of vegetables into carb-tastic meals makes them healthier, right? One of those meals I love to healthify is pizza. I now totally prefer homemade healthy pizza to any other pizza. (Unless we’re talking Pi Pizza deep dish from St. Louis. That pizza is amazing and pretty much we can’t go to STL without eating it.) 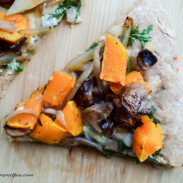 Whole wheat crust, lots of veggies, and no greasiness makes homemade pizza worth the effort. I know I say this about a lot of my recipes, but if I can make homemade pizza dough, anyone can, and the fresh dough tastes so good. If you’re into meal prepping, you can make the dough on the weekend and freeze it, or even let it hang out in the fridge overnight with then a couple hours at room temperature to rise. 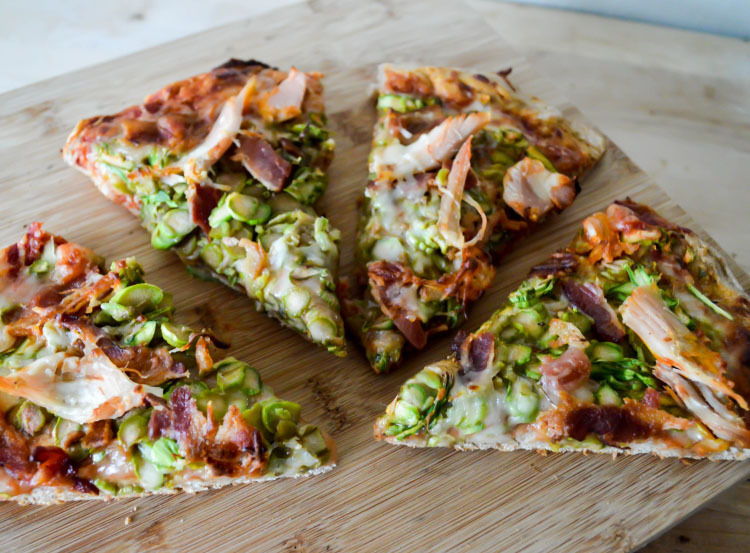 The idea for asparagus, turkey, and bacon pizza came about as a “use up all the Easter leftovers” meal. Since Ryan and I will always chose turkey over ham, we roasted up a huge turkey for Easter and enjoyed it with several fresh spring vegetables, including asparagus. And, well, after giving up meat for Fridays, of course we enjoyed plenty of bacon on Easter weekend. This pizza is definitely worth making anytime of the year, though, so don’t wait until you have leftovers to make it. Admittedly, Ryan was a little hesitant about the idea of asparagus on pizza. Asparagus can have a bit of an earthy flavor to it, so to avoid overpowering the pizza with that taste, I finely sliced the asparagus in my food processor using the slicing discs (KitchenAid food processors can practically prepare a whole meal for you, they do so much!). You could also use a mandolin, a vegetable peeler or a knife and a steady hand to cut thin slices or ribbons of asparagus. Honestly, asparagus may be one of my favorite pizza toppings now, especially when paired with bacon! It adds such great texture to the pizza and really compliments the cheese. Then again, when can you go wrong with pizza and bacon? Combine the flours, salt, and yeast in a mixing bowl, and then add in the water and oil. Stir into a dough, and then knead for 1-2 minutes by hand. Let rise for 1-2 hours in a warm place, such as in an off oven. Roll out the dough into a pizza pan. Cook the bacon on the stove. Drain any excess fat, pat dry, and crumble into large pieces once cooled. 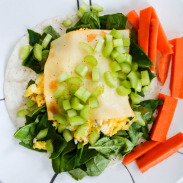 Use a food processor, knife, or mandolin slicer to finely slice the asparagus. Spread tomato sauce on the pizza dough and season with salt, pepper, and basil. Top the dough with the mozzarella, asparagus, parmesan, turkey, and bacon. Cook for 10-12 minutes or until the edges are golden brown and the cheese is bubbly. Serve with some beer, because, you know, we’re all about balance here. 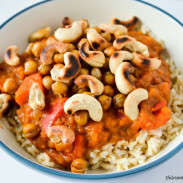 PS: Sorry for the less than stellar photos, but this recipe was just too delicious not to share! One of these days I WILL make my own pizza dough. Seriously. I’m an ALL the veggies person with a protein, but I also love me prosciutto and fig pizza. And I’ve had smoked salmon on pizza before. Honestly, as long as it is on a thin crust with minimal cheese and olive oil and with super fresh ingredients? I’m in. Thank you! Having a big kitchen must be one of the most exciting things of a new home – all that counter space! This looks AMAZING. 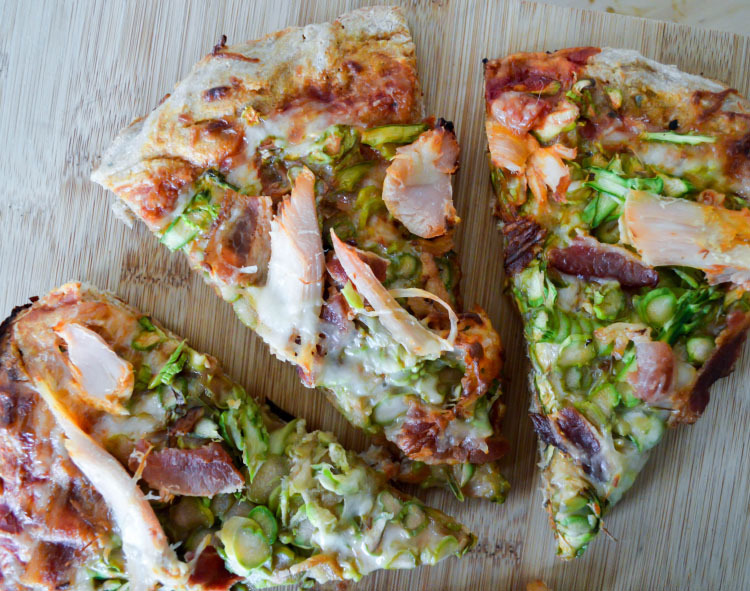 I love the turkey/bacon combo, and I’ve never even thought to put asparagus on a pizza! Oh my gosh, that looks INCREDIBLE. I love the idea of asparagus on pizza, gives it kind of a primavera feel to it. Thank you! Now that you say it, it definitely reminds me of primavera – so springy and fresh!